Active citizen participation is needed to safeguard government. 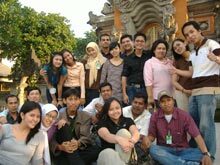 In order to educate Asian youth on their responsibility to ensure governments are truly representative of their needs, the Friedrich Naumann Foundation and the Young Liberals and Democrats of Asia (YLDA) held a workshop on engaging citizens for responsible and effective governance in Jakarta, Indonesia from 22-27 November 2007. Hosted by Garda Bangsa in cooperation with the Indonesia Democratic Party of Struggle, 25 youth leaders from eight countries gathered together to find common solutions to the problems hampering good governance and citizen participation in the region. To concretize their learning, participants also broke into small group discussions on political parties, government work and civil society. Each group presented a paper on governance and citizen participation that included recommendations for their own countries. Summing up the task for the future, Adinda Tenriangke Muchtar, political analyst from the Indonesian Institute’s Center for Public Policy Research, said: "Scrutinizing government transactions should be seen both as a right and [a] responsibility of citizens." She continued, “Citizenship in a democratic society implies vigilance and political awareness, and these are best exemplified and exercised by the young." She enjoined the youth to participate in government not only by joining political parties but by exploring “other avenues of activism.” Muchtar however also stressed that government has an equal responsibility in that it has to create structures that foster a high-level of citizen participation. 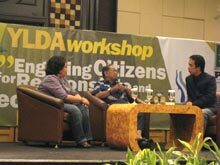 The workshop ended with YLDA holding is annual general assembly. It evaluated its programs, planned its activities for next year and elected a new executive committee. Rajendra Mulmi remains president.